The reigning Arizona FIRST LEGO League state champion, Team TOXiC from Sonoran Science Academy, is headed to an international competition. Team TOXiC, the group of sixth- and seventh-grade students that took the top prize at the 2011 FIRST LEGO League (FLL) State Championship at Arizona State University, will compete in FIRST’s Food Factor World Festival April 25-28. The team from Sonoran Science Academy in Tucson will join thousands of youngsters from the United States and about 40 other countries at the event in St. Louis, Mo. FIRST (For Inspiration and Recognition of Science and Technology) was founded by renowned inventor Dean Kamen to spark young students’ interest in technology fields. ASU’s Ira A. Fulton Schools of Engineering began overseeing the Arizona FIRST LEGO League robotics program in 2008. Since that time the number of student teams participating has more than tripled. Last year a record 266 teams of Arizona middle school students – more than 2,500 youngsters in all – participated in the program. More than 400 students whose teams placed in top spots in regional tournaments competed in the year-end state championship at ASU’s Tempe campus. In the program, students build, design and program autonomous robots using LEGO MINDSTORMS kits, and test their robots through a series of games and demonstrations with engineering and science themes. Team TOXiC includes Kate Ciaramello, Emma Galligan, Robert Gauthier, Jose Hernandez, Liam Koenneker, Zakaria Lamri, Quincy Lyons and Nathan Vandivort. The squad is coached by teachers Serdar Caparoglu and Pamela Vandivort and aided by parent mentors Dan Gauthier, Said Lamri and Julieanne Lamri. The students “feel responsible for representing their school, state and country” at the World Festival, says coach Vandivort, the eighth-grade physical sciences instructor at Sonoran Science Academy. Along with its robot named Adios Contaminos, the team has explored the food-safety theme of last year’s Arizona FIRST LEGO League competition by researching waxes that are applied to fruits and vegetables. The manufactured waxes are used to replace the natural waxes that are removed when fruits are washed after harvesting to remove dirt and grime. The waxes help fruits and vegetables retain moisture, inhibit mold growth in produce, prevent damage and disease, and enhance the products’ appearance. Team TOXiC sought to learn more about any potential hazards of consuming wax-covered produce. The students found most of these waxes contain gluten, a problem for anyone eating a gluten-free diet. Vandivort says they also discovered that bacteria often get trapped underneath the wax. They experimented with traditional household food-cleaning methods to find an efficient way to remove the waxes, and then measured the levels of bacteria still on the food. The experiments involved three fruits and three vegetables from five grocery markets examined under various conditions. The results showed that warm water and a mixture of soap, lemon juice, baking soda and vinegar is most effective at cleaning the produce. To prepare for the competition at the Food Factor World Festival, the students used their research to develop a product to remove the bacteria and wax from fruits and vegetables that works better than their original cleaning solution. They’ve designed a test to find out what ingredients in their mixture work best to kill bacteria, and then found the most efficient mixture of these ingredients to develop a safe product that can be introduced on the market. They haven’t decided on a name for the product, “but so far, we’ve been calling it NON-Toxic by TOXiC,” Vandivort says. Their results – along with an improved robot – are to be revealed at the Food Factor World Festival. To share their research findings, Team TOXiC has networked with various agencies that promote food safety, including the Pima County Health Department. The team has been invited to present its findings at the department’s board of directors meeting in October. As part of their outreach efforts, the students have also drawn and written a comic book telling the story of their research project that has been published by Bookmans Entertainment Exchange. The research, the robotics and hands-on learning has given the students a passion for science and engineering while teaching them teamwork skills, coach Vandivort says. “They have all grown tremendously as a result of this program. I’ve seen them mature academically, socially and emotionally,” she says. A second Arizona contingent will participate in the Food Factor World Festival: The Robo Buffs, a team of first-, second- and third-grade students at Scottsdale’s Navajo Elementary School. Navajo Elementary’s curriculum focuses on STEM subjects (science, technology, engineering and math), incorporates lessons that use LEGO Robotics and has had robotics studies for the past four years. 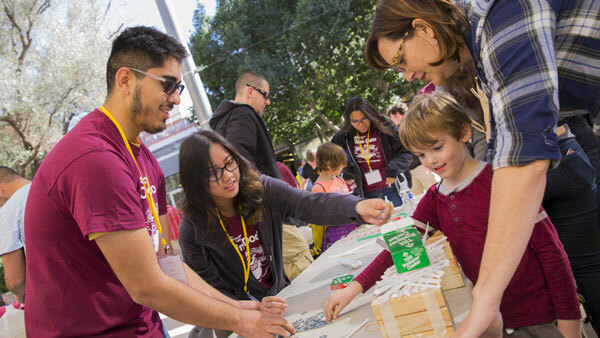 That commitment to STEM education has helped the Robo Buffs get support for its trip to the Food Factor World Festival from a Care for Education grant through the LEGO Foundation’s We Care and Share philanthropic program. Visit the official FIRST LEGO League World Festival site for more details. Read about the Arizona FIRST LEGO League program. 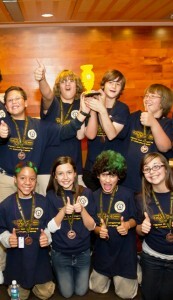 View a video of the 2011 FIRST LEGO League Arizona State Championship.